Rule #1: All important men have assistants. Rule #2: Men rule the world. Still. Rule #3: There is enough money. There is so much money. Tina Fontana is a thirty-year-old executive assistant to Robert Barlow, the CEO of Titan Corp., a multinational media conglomerate. She’s excellent at her job and beloved by her famous boss—but after six years of making reservations and pouring drinks from bottles that cost more than her rent, the glamour of working for a media company in New York has completely faded, but her student loan debt has not. When a technical error with Robert’s expense report presents Tina with the opportunity to pay off the entire balance of her loans with what would essentially be pocket change for her boss, she hesitates. She’s always played by the rules, but this would be a life-changer. As Tina begins to fall down the rabbit hole of her morally questionable plan, other assistants with crushing debt and fewer scruples approach her to say that they want in. Before she knows it, she’s at the forefront of a movement that has implications far beyond what anyone anticipated. I'm playing catch-up this week and trying to write come reviews from earlier in the summer. 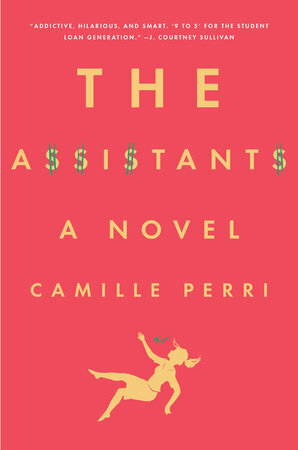 One book that I loved was THE ASSISTANTS by Camille Perri. This book was so much fun! It was smart and funny and highly entertaining. THE ASSISTANTS tells the story of Tina Fontana, a young executive assistant to the CEO of a mega media company. She has worked hard for six years, sometimes doing some rather menial chores; and her boss thinks the world of her. Unfortunately, her success as a personal assistant doesn't translate into big bucks. She still has some mega student debt outstanding! One day, there's a technical glitch in her boss's expense report that opens up a new world for Tina. She realizes that she can "trick" the system and get enough cash to pay off her student loan without anyone knowing. It's just chump change for the company and it would be huge for Tina not to have to worry about so much of her college debt. That's not to say that Tina doesn't have some guilt about stealing from the company. However, a few other assistants catch on the Tina's plan... and they want in. The sneakiness escalates and Tina finds herself heading up a major movement to help others who are crushed with student debt! I thought THE ASSISTANTS was delightful! I have to say that it reminded me a bit of the old movie Nine to Five because the assistants were outsmarting the bosses. I definitely liked the character of Tina, and I thought the author made her dilemma realistic. And while this book was pretty much a light summer read, I do think it touched upon some serious issues facing today's younger generation -- crippling student debt. But don't get me started!!! I was definitely impressed with Ms. Perri's writing, and I loved the creativity of the story. I think I read somewhere that she realized how easy it would be to "steal" money from her company and then it translated into an idea for a book. How clever! I also appreciated her writing style. The book was, first and foremost, an entertaining story; however, I also found her observations to be smart and witty. I'm sure not everyone who reads this book will feel the same way about the message about student debt, but with a high school senior, college costs are on my mind a lot lately. I realize that it costs a great deal to get an education, but I also question how so many kids can come out of college at 22 years old with $100,000+ in student loans. I fear that young people will just keep incurring more and more debt into their 30s, and I have to wonder how they will ever get out of this vicious circle. I'll get off my soapbox now! THE ASSISTANTS would make a great book club selection especially if you are looking for something a little lighter. There is a reading guide with ten interesting questions, but honestly, I'm not sure you need one. Some of the themes that you will want to discuss are integrity, honesty, guilt, student debt, society, corporate culture, trust, secrets, revenge, wealth, excess, and friendship. I really enjoyed THE ASSISTANTS. Highly recommended to readers who are looking for a hilarious and rather clever story! I received a copy of this novel from my local library. This does sound like a fun book. College is terribly expensive and it's gotten so everyone thinks they have to live the good life while they're in school.